1881 Maurice Green (millers labourer) and children Eliza, Arthur and Emma. Notice how the childrens' names change over the years. 1960 The house burnt down. 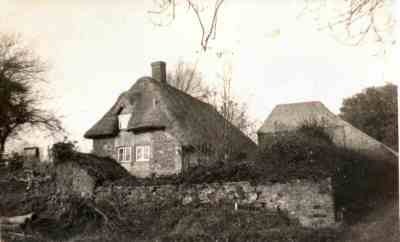 It was eventually rebuilt in the Loxwood area. The local paper of the day reported: Firemen wearing breating apparatus spent nearly seven hours extinguishing a fire at Darkdene (sic), a 17th century thatched cottage at Nutbourne Place, near Pulborough, on Friday. There was a water tender escape and a Land Rover from the Storrington station, and water tender escapes from Billingshurst and Petworth. 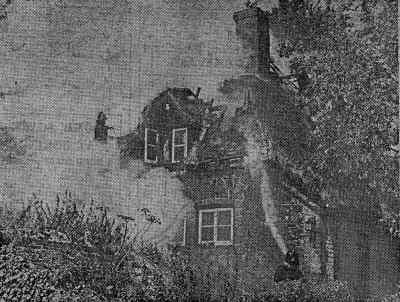 The thatched roof of the cottage has been completely destroyed and the building was severely damaged. 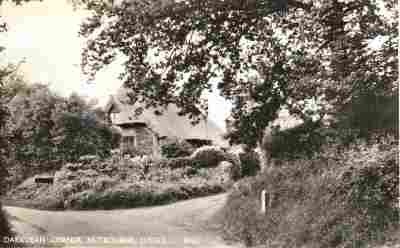 Station Officer D. Mason, of Storrington, told the Gazette that the firemen worked at Darkdene from 11.40 a.m. until 7 p.m. "There isn't much you can do to save a thatched roof," he added.